Better than Best Practice offers a new way of thinking about classroom practice, professional development, and improving teaching and learning. This companion book and website together offer a selection of rich and realistic video-based case studies, context and narrative, step-by-step guidance through key issues, and commentary and debate from a range of expert contributors. Carefully chosen video clips from primary school literacy lessons show real teachers in a variety of often knotty situations: classroom conversations that take unexpected turns; grappling with assessment; managing disagreements, to name a few. The book explores the educational potential of classroom talk and, in particular, the promise and problems of dialogic pedagogy. 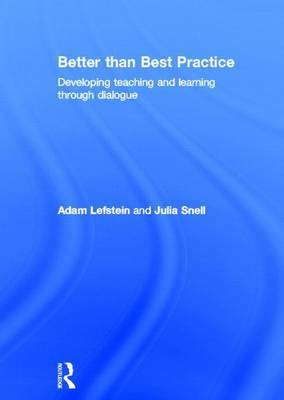 With an emphasis on the complexity and `messiness' of teaching, Better than Best Practice considers how to learn from observing and discussing practice in order to develop professional judgment. It offers practical advice on how to organise and facilitate video-based professional development in which teachers share their practice with colleagues in order to learn from one another's challenges, problems, dilemmas and breakthroughs. This exciting new resource argues that critical discussions of practice, which highlight dilemmas instead of prescribing solutions, help to develop and support thoughtful, flexible, and insightful practitioners: an approach that is better than best practice.